Fitness is one of the most important aspects of this game. You should now how it works if you plan to have success on FIFA 19 Ultimate Team. 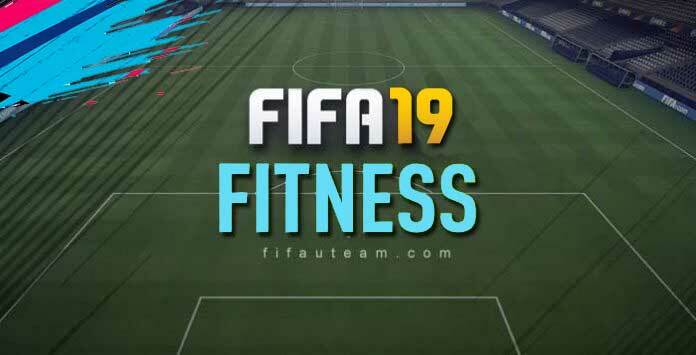 We’re here to help you out with this FIFA 19 fitness guide. This guide was created to fill the void of lack of information concerning this theme. It is devoted to the less experienced, who will be able to follow some valuable tips that will help them improve their club, but also to the more experienced that might still have a few wrong thoughts. We will show you what fitness is, its importance in the game and which factors may affect it as well as its variation. We’ll be deconstructing the stamina concept and describing everything concerning this theme, including the fitness coaches cards, fitness training and the slight co-relation there is between injuries and fitness. We will cover everything, nothing will go unnoticed. What is FIFA 19 Fitness? Fitness is an English word that means “being in good shape”. It is directly related to one’s agility, speed, body balance and motor coordination. In FIFA 19 Ultimate Team, just like its predecessors, the fitness is numerically measured on a scale of 1 to 99. The higher, the better. 99 corresponds to a player’s ideal physical condition. It’s the highest fitness possible. 1 corresponds to a critical state you’re not going to want to be familiar with. During a match, each player has two fitness bars: the instant bar, represented by a blue bar that goes red in extreme situations; and the accumulated, represented by a white bar overlaid by the blue bar. The first decreases during the sprints, ball disputes or other efforts, and then it regenerates. The second will gradually reduce over a game and serves as a ceiling for the instant fitness bar. A careful analysis to the following image helps to clarify any questions. The game runs from 1 to 5 and, as you can see, the biggest of the bars is getting smaller. In 1, the bar is almost complete. The only reason to not be completely full is because the player did not start the game with fitness 99. Unlike what happens in 3, in 2 the player is running and therefore is momentarily more tired, ie, less able to continue to make efforts. However, the white bar is bigger which means that with a little rest he will be in better condition than in 3. In 4 he is very close to having to leave the game because he can not make efforts for a long time anymore. He gets tired easily. Finally, in 5 the player reached the limit situation. He has to leave or he will get injured. There is a lot of discussion on the first three factors. Players tend to improve their playing skills looking for the best player cards and building squads with maximum chemistry, but not always they give the players’ fitness proper attention. This one is definitely the most ignored but it shouldn’t be. A player with very low fitness will have poor performance. His movements will be slower and obviously, he won’t be able to keep up with the teammates and opponents. Besides, he’s more likely to get injured. With defective fitness, Lionel Messi may look like a bronze player. A player’s fitness is improved by rest and moderate physical exercise, and it worsens with too much exercise and potential injuries. That’s what happens both in real life and in FUT 19. As the players keep on playing, their fitness level decreases. Resting and specific training can give their ideal fitness back. A player’s spent fitness is directly proportional to how long he’s on the pitch. If he plays just for one half, he’ll have spent half the fitness he would’ve spent playing 90 minutes. Obviously, this isn’t the only factor since there are types of matches that require more or less effort. You can make a substitution if you feel like sparing some player’s fitness, one you’d like to use on the next match, but if you do that you’ll be spending an extra contract. Also, the substitute will have his fitness decreased by the end of the match. Players get tired as they make effort. This effort rate is measured in FUT 19 by the amount of meters traversed and the intensity and frequency of the body’s work. Players such as goalkeepers tend to move less around the pitch and usually don’t challenge the ball, therefore spend less of their fitness. This way they’re able to keep on playing for much longer than the average player without having their fitness drastically decreased. Anyway, the effort made by a player depends exclusively on who’s controlling. In that case, yourself. Immediately after a game, you can visualize the fitness decrement and increment for each player, even your opponents’, on the Player Ratings menu / Fitness, such as the image below exemplifies. It’s not only possible for you to see how many fitness points each player has lost, but also you’re able to see how many points each substitute eventually restored (lower left corner). The reserves’ physical restoration isn’t indicated in this menu, though. Also, none of this is available when it is a friendly, which by the way doesn’t make sense for us since there is fitness decrease for them as well. Losing and restoring fitness depends on the type of matches you’re playing. No matter the match mode players can always lose fitness points. Although, fitness restoration is only possible if it’s not a friendly match. General rule, a field player can lose between 7 and 0 fitness points along the match, although on most cases only 3 to 5 points are lost. ST’s are the ones that lose less points. On the other edge of the field the goalkeepers don’t usually lose more than 2 points, sometimes they don’t even lose a single point. Resting outside of the 23 selected players for a squad does not allow fitness restoration. If you want a player’s fitness to restore, you’ll have to put him among the substitutes or reserves. It’s the same for both, this kind of fitness restoration is strictly equal. Most of the times, a player that’s not used during a match restores 15 fitness points, except for when the difference between the maximum fitness points (99) and his current value is less than 15, of course. In that case, it restores what’s enough to reach 99. They cannot have more than fitness 99 even if they apply a fitness card. Besides that, a player can’t restore more than 35 fitness points in a single match of resting. In order to restore a player’s fitness immediately, you have to apply him a fitness card. There are two types: individual and squad. You can find them on the market or inside packs. As long as the player is not injured, you can apply him unlimited fitness cards. Fitness cards, which can be gold, silver or bronze levels, increase the fitness shown on a player’s card. If it’s an individual one, it only restores the fitness of one player. If it’s a squad type, it restores the fitness of all 23 players of the squad. When you apply a fitness card on a player, his value can’t surpass 99, even if the current value plus the fitness card value equals more than that. For this reason, we don’t recommend the application of gold fitness cards to your players since they increase too much fitness, at most times they would go to waste. The bronze individual fitness cards increase 20 fitness points and are often enough, especially when having the effect of staff to maximize the result. Using fitness training cards is the most valid method for fitness restoration but it does require a few coins. If you want to know more about this type of card, click here. The effect of fitness cards can be maximized if you have a few fitness coaches in your club. They help the players enhance their fitness through a bonus applied to the fitness cards’ final effect. Fitness coaches, which can be gold, silver, bronze, rare or not, have a percentage written on them that go from 1 to 5%. 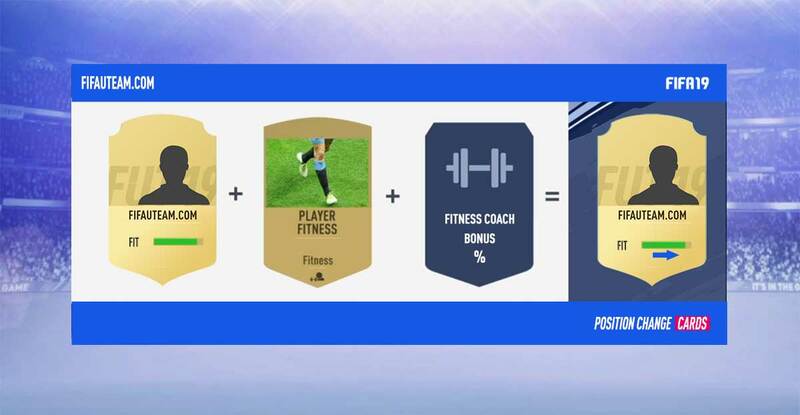 When you apply a fitness card on a player or a squad, the number of fitness points added receives a bonus for all the fitness coaches’ values you have in your club, which for themselves can’t surpass 50%. If you’re the kind of player that frequently uses fitness cards, it’s really important that you have this type of staff in your club. They’re relatively cheap and don’t require contracts, and still they make your players’ fitness restoration become a much easier process. However, this is their only job. Unlike many people think, having fitness coaches doesn’t influence the players’ natural fitness restoration. While they’re resting between matches nothing different happens, it goes at the same speed as if there were no coaches in the club. If you want to know more about this type of cards, click here. When a player gets injured, there are two specific information written on his card: the number of matches he will be unable to play and the type of the injury he’s got. If you leave him to rest among the reserves for as long as the period of the injury, he will heal naturally and become available again. Fitness cards are useless if a player has an injury. In this case, you’ll have to apply a healing card if you want to use this player immediately, or you can at least reduce his healing period. There are two types of healing cards: the ones that are specific for each type of injury (foot, leg, knee, arm, head, shoulder or back), that can reduce up to 5 matches, and the ones that cure a player no matter which type of injury he’s got, reducing the wait up to 4 matches. When you use one of these cards, the number of matches written on the player’s card is reduced according to its level. If the difference between them is equal to or less than zero, you’ll be able to use the player right on. If the difference is superior, you can keep applying healing cards until you have your player completely healed. The healing cards, which can be gold, silver or bronze, should only be used if you really need a player in particular that’s got an injury. It’s recommended to avoid direct contact with aggressive players and using players with very low fitness, this is the best way for you to avoid having your players injured. The effect of healing cards can be maximized if you have a few physiotherapists in your club. They help your players heal from injuries through a bonus applied on the healing cards’ final effect. Physiotherapist cards, which can be gold, silver, bronze, rare or not, have a percentage written on them that go from 5 to 15%. When you apply a healing card on a player of your squad, the number of matches of rest needed receives a bonus for all the physiotherapists’ values you have in your club, which for themselves can’t surpass 50%. If you’re the kind of player that frequently uses healing cards, it’s really important that you have this type of staff in your club. They’re relatively cheap and don’t require contracts, and still they make your players’ healing become a much easier process. However, this is their only job. Unlike many people think, having physiotherapists doesn’t influence the players’ natural healing. While they’re resting between matches nothing different happens, it goes at the same speed as if there were no physiotherapists in the club. Q: How can my players recover their fitness level? A: Make them rest in the substitutes/reserves. Q: Is my is fitness also affected in friendlies matches? A: Yes. You lose fitness points but your fitness restoration is not possible. Q: How much the fitness level increases when player is resting? A: Usually no more than 15 points per match. However, the recovery rate may be higher if the fitness level of the player was really low. Q: How much fitness I lose in a single match? A: It depends of many factors. Most of the times, a field player lose 3 to 5 points and a goalkeeper not more than a single point. Q: What’s the difference between fitness and stamina values? A: Fitness value is how much fitness a player starts on in-game. Stamina value represents how fast a player’s fitness deplete.